The pathomorphological features noted in 47 cases of HIV/AIDS studied on autopsy (39 cases) and surgical biopsy material (8 cases) over a period of 8.5 years are described here. The serum samples of all cases and 26/29 CSF samples tested were positive for anti HIV antibodies. Majority of patients were young adult males in the age group 25-35 years. History of high risk behaviour was available in 59.6% cases. 38/39 autopsied cases succumbed to various opportunistic infections. Infection by a single pathogen was noted in 76.3% cases and due to multiple infectious agents in 23.7%. The commonest opportunistic infection was cryptococcosis (59%) followed by toxoplasma encephalities (28.2%) and tuberculous meningitis (25.6%). The others included meningococcal meningitis, herpes simplex, cytomegalovirus and acanthamoeba encephalitis noted in one case each. Features meningococcal meningitis, herpes simplex, cytomegalovirus and acanthamoeba encephalitis noted in one case each. Features of HIV leucoencephalitis was noted in one autopsy and tow brain biopsy specimens. Complete body necropsy carried out in 11/39 cases revealed disseminated cryptococcosis in 5, tuberculosis in 4 and features of HIV related changes of lymphoreticular organs in 3 cases. Pneumocystis carinil pneumonia was noted in 2 patients along with cryptococcosis. Diagnostic lymph node biopsy in 3 patients revealed tuberculous lymphadenitis in 2 and infection by non-tuberculous mycobacteria in one. Evidence of IIIV associated neuropathy was noted in 3 cases. 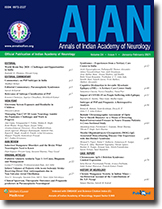 In the present series, the incidence of cryptococcal meningitis was very high compared to neurotuberculosis as reported from other clinical and one autopsy series from other parts of India. Similarly, the incidence of toxoplasma encephalitis was also higher. The type of laboratory support and the experience of the pathologist play a crucial role in accurate identification of the pathogens. Therefore, a high index of clinical suspicion and a proper diagnostic approach to HIV/AIDS patients is required in developing countries to identify various pathological lesions. Cerebro-vascular disease in an important and a frequent cause of dementia. However, the prevalence and magnitude of global cognitive dysfunction in acute stroke has not been studied. Folstein's mini mental state examination (MMSE) is 2 sensitive and reliable test and may serve as a simple tool for screening dementia. Fifty consecutive patients with first ever completed stroke in life and no past history of cognitive disturbances were administered MMSE at least 10 days after the onset of stroke. Cranial CT scans were done in all after 48 hours of stroke. CT scans were blindly analysed and graded for number, location and volume of infarctions, white matter leukoaraiosis (WMLA) and cortical and sub cortical atrophy. The radiological parameters of those with MMSE score of 23 or less on MMSE. Of all the conventional risk factors, only age of the patients was significantly higher in the "demented" group. Of the radiological parameters namely-number and volume of infarcts, WMLA, bi-frontal ratio (BFR), 3rd ventricular ratio (3 VR), cella media index (CMI) and cortical index (CI), only cortical index was significantly more among patients with lower MMSE scores. Prevalence of global cerebral dysfunction first ever ischaemic stroke was 46% in this study. Advanced age and cortical atrophy appear to contribute to the low scores on MMSE. Though, volume and number of infarctions were higher among patients with low score, the differences were not statistically significant. Balint's syndrome is a rare clinical condition characterized by a triad of occulomotor apraxia (psychic paralysis of gaze), optic ataxia and visual inattention and usually follows bilateral parieto-occipital lesions. We report this syndrome occurring in a patient with a solitary metastasis in right occipital lobe. To the best of our knowledge it has not been previously described in English literature. Pressure over the opposite occipital lobe due to mass effect, diaschisis and extension of edema along the corpus callosum involvement may contribute to this exceptional phenomenon.